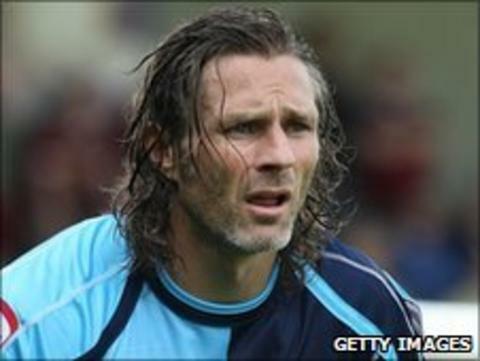 Wycombe Wanderers have agreed new one-year deals with captain Gareth Ainsworth and goalkeeper Steve Arnold. Stuart Beavon has signed for two years while Chris Westwood, Leon Johnson, Danny Foster and Matt Bloomfield are considering 12-month contracts. Jon-Paul Pittman, Keiran Murtagh, Jerome Federico, Lewis Montrose, Alan Bennett, Sam Belcher, Dan Fitchett and Stuart Green have been released. "I'm really pleased," 38-year-old Ainsworth told the club website. "Just still to be playing football is awesome. "I'm really chuffed to be here at Wycombe and to be part of next season, and I'm ready to go again and come back firing on all cylinders." Ainsworth, who celebrated his 38th birthday on Tuesday, has played 46 times this season, scoring 11 goals in a campaign which saw the Chairboys return to League One at the first time of asking.